This pair of Underdash Arches are for both the XK140 Drophead Coupe and Roadster. These are the wooden corner blocks that are covered in vinyl and go in the space between the front kick panels and the lower part of the dash. They are shipped un-upholstered. 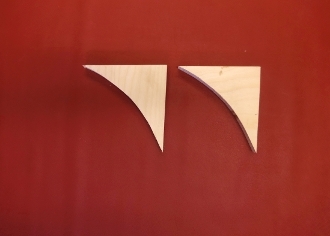 Our wooden Top Bows and Tack Wood are made of solid hardwood with a minimum number of laminations. This wood is best for holding tacks and resisting decay. Some bows may naturally warp slightly and car frame configurations may vary, but if handled and installed properly all bows will readily attach to their frames.